There are not a lot of changes in the new M6. 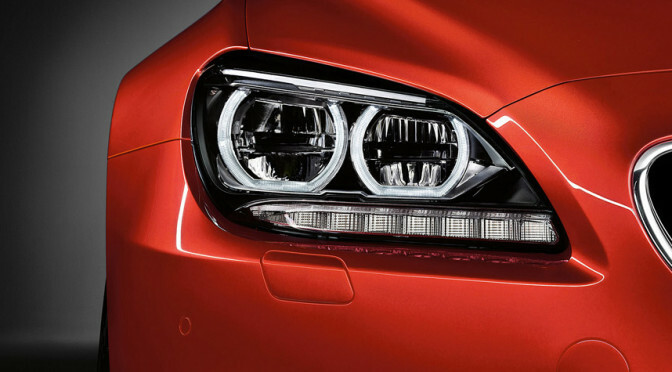 One of the cosmetic changes this vehicle came with are the new full LED headlights with slightly different design, and the same goes for the area around them. In places where turn signals used to be in the older models there’s a long black strip, placed on the bottom of each headlight cell. Buyers can also choose to buy additional Competition Package that comes with chrome exhaust tips and 20 inch alloy wheels. In addition to all of this new model comes with the range of 11 exterior colors and numerous interior packages. When it comes to interior there are not to many changes as well. Instrument cluster came with redesign that’s been called “iPhone-style” Central Information display. Upholstery and the interior design also have some smaller changes including black shades that’ve been added to the leather upholstery version, which also comes with some nice contrast stitching as well as chrome accents painted in black. Most of the changes that came with the new model presented on 2015 NAIAS happened under the car’s hood. NEw engine got one more pund feet of torque and it now comes with 501. We are talking about the 4,4 liter twin turbocharged four cylinder unit that is also able to produce 560 horsepower, same as in older version. When it comes to acceleration coupe and Gran Coupe versions have slightly better acceleration than convertible version and they are able to reach 62 mph in only 4,2 seconds, while the convertible is only one tenth of a second behind. New model has quite good fuel efficiency and it is able to reach 23 mpg in highway conditions. Maximum speed is 155 mph. If buyers decide to choose Competition Package instead of standard version they will get 15 horsepower extra. It will also come with one second faster acceleration due to power increase and the new sportier exhaust system.